It’s entirely possible that I’ve been on a bit of a cookie bender for the last few weeks, and for that I’m not the least bit sorry or even ashamed. Life’s too short to skimp on the cookies and, since I can only eat them sparingly, I like to make them count. Like twice-the-chocolate kind of count. 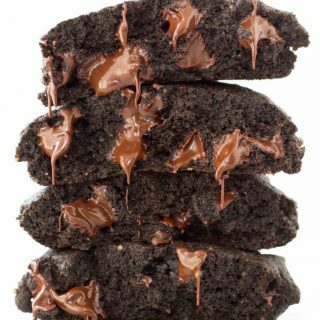 From the title (and, admittedly, appearance) of these chocolate brownie cookies, you would think they would be kind of…horrible for you. While they are soft and dense like a brownie, and oozing with melted chocolate chips (especially when eaten directly out of the oven, which I highly recommend), they’re actually made with whole “grain” buckwheat flour (“grain” because technically buckwheat is a seed, albeit a grain-like one, sort of like quinoa), making them gluten-free, grain-free and (in some circles, depending on your definition) paleo. Or, paleo-ish. Or, worth making an exception for. Buckwheat is an ancient grain that is not actually related to wheat. It’s actually related to rhubarb, if you can believe that. It has a nutty flavor and an excellent nutritional profile if you’re into that sort of thing, but if you’ve ever eaten a soba noodle, you already knew that. 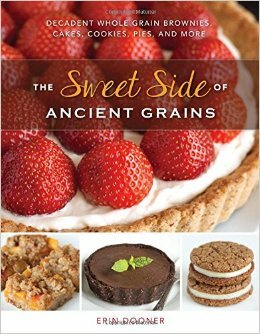 I don’t use it often – thou gh I used to – because I started reacting badly to it, but after eliminating it for awhile, reintroducing it in small (cookie-sized) amounts was well worth it when I got my hands on a copy of my friend Erin‘s new book The Sweet Side of Ancient Grains. Since I did some recipe testing for Erin while she was writing, I was lucky enough to try these cookies a long time ago (as well as a hazelnut crostata that basically brought the house down when I brought it to work, and a peanut butter brownie that more than one person compared to a controlled substance) and it’s been really difficult to hold out on sharing these with you for so long. But, now that you know, please, please don’t waste another minute without these cookies in your life. Or any of Erin’s recipes, really. 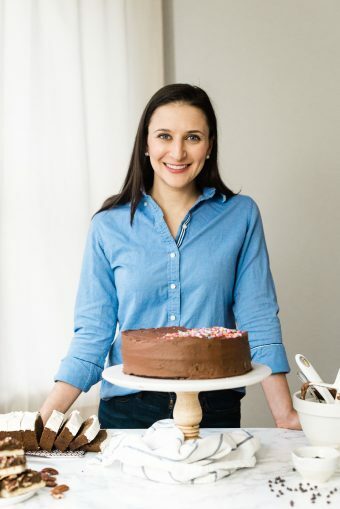 Her move to Germany forced her to put aside the all-purpose flour (which is, apparently, impossible to find over there) and learn to bake with whole grain (and “grain”) flours instead. Thus, the theme of her book, which is filled with page after page of recipes and photos so enticing that you’ll have flagged pretty much the whole book as “to make (urgent!!!! )” before you know it. This cookbook is a total gem. Erin is one of those people whose hard work, dedication and meticulousness comes through loud and clear in every recipe, and this book obviously took some blood, sweat and tears. It’s well worth grabbing a copy, if for nothing else that her dedication to rich, fudgy, dense chocolate brownies, cakes and cookies that will satisfy even the highest levels of chocolate snobbery (I speak from experience). But don’t get me wrong; you’ll also find creamy, fruity, crumbly, and every other flavor you could ever want. Not to mention the fact that, in addition to buckwheat, you’ll be introduced to new ingredients like teff, emmer and quinoa flour, and see old favorites like oat flour (and, yes, whole wheat). The book also contains a simple guide to the many recipes that are vegan, gluten-free or dairy-free. Basically, you’ll be busy for a long time enjoying wholesome variations on your favorite recipes. So, don’t miss this book – or these cookies! In a medium mixing bowl, stir together the buckwheat, cocoa powder, baking powder, baking soda and salt. Set aside. In the bowl of a stand mixer fitted with the paddle attachment (or in a large mixing bowl, and using a hand mixer), beat together the sugar, eggs, almond butter, melted coconut oil or butter, and vanilla until well combined. Add the flour mixture and beat until just combined. The dough will be thick and sticky like brownie batter. Wrap the dough in plastic wrap and refrigerate for 2 hours, or until firm enough to roll into balls. Preheat the oven to 350F. and line a baking sheet with a nonstick pad or a piece of parchment paper. Roll the dough into 1 1/2 inch balls and place 3 inches apart. Press additional chocolate chips into the tops of the cookies (optional). 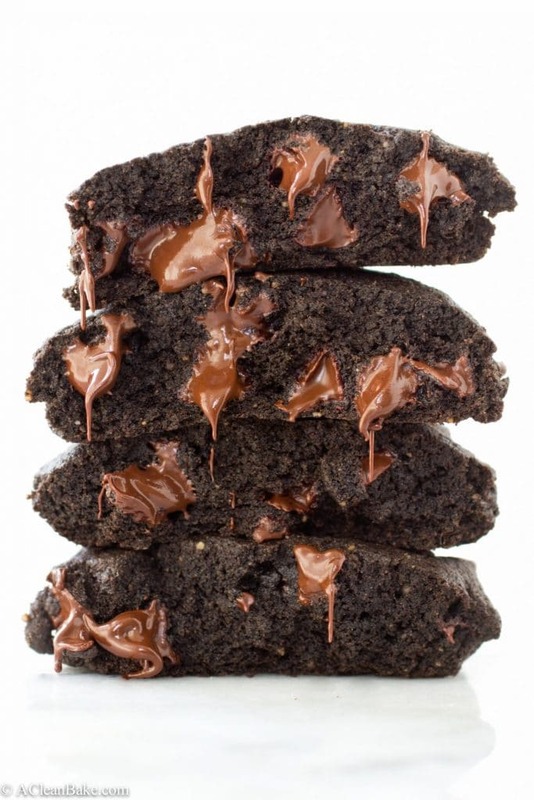 Bake for 8-11 minutes or until the tops of the cookies are no longer wet in the middle . Let cool completely on the baking sheet. Store in an airtight container at room temperature for up to 4 days. I used Hershey's Special Dark cocoa powder, which is half Dutch-processed and half natural-processed. I thought it worked fine. I dialed back the salt slightly, to 1/4 teaspoon. If you want a chocolate-peanut butter cookie, you can replace the almond butter with PB. Note from Erin: Don't be tempted to over bake these! They will be very soft when they come out of the oven, but will firm up as they cool. This recipe from book "The Sweet Side of Ancient Grains" by Erin Dooner and has been reprinted with the consent of the author. Nora, these look so delicious! I was just thinking yesterday that it has been a long time since I’ve made cookies or brownies. This recipe appears to have the best of both. I have never cooked with buckwheat and am now eager to try it! 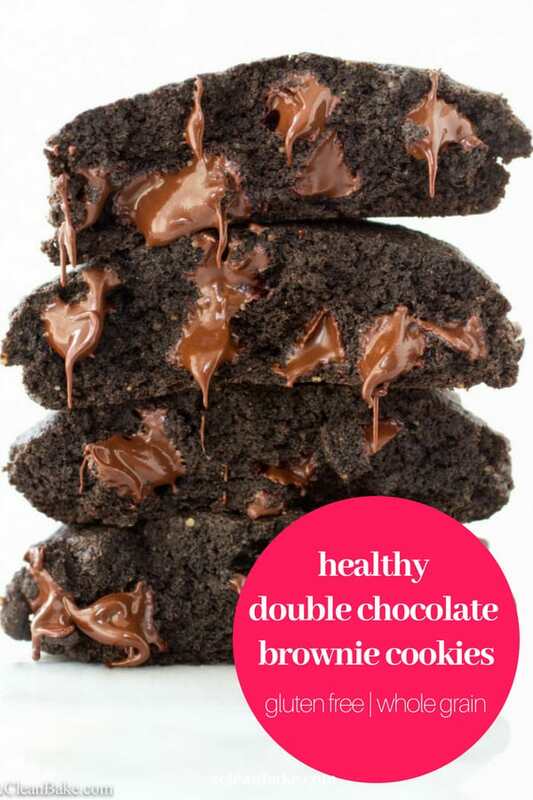 It sounds like you are overdue for a brownie, or a cookie – but better yet, both! Cocoa-powder – is that 3/4 cup? I’m so, so happy that you enjoyed these cookies and the other recipes. A million thank yous for this very kind write-up! Mmmm, looking so decadent! Thanks for the recipe! Actually yes!! You can sub whole wheat flour 1:1 for buckwheat flour in this recipe. To be honest, I am not too familiar with how spelt flour works in recipes, so I’m not sure if it’s an easy sub. But definitely whole wheat! I have some extras in my freezer! I will save some for you! PS: Isn’t Christy the best!? How exciting to see these are made with buckwheat!! YaY!! And that first photograph, Nora, my mouth was watering when I saw these on IG and now, again, as I scroll back up to see them… like now!! Looking forward to whippin these up! <3 Thank you, Nora! Isn’t buckwheat great!? I hope you enjoy these Traci! I see you with that buckwheat flour – I love buckwheat cookies, they always turn out delightfully nutty! They do! Admittedly it’s an acquired taste, but I’m glad you love it! I made these today with coconut oil (and stevia instead of sugar). While the flavor is delicious, my batter and cookies turned out very crumbly. Should I add more eggs? More oil? Maybe almond milk? They remained as dry balls as they cooked (didn’t sink down at all) and they crumble to pieces when I take a bite. Hoping to remedy in the next batch! Hi Andrea! It sounds like the flour or cocoa powder may have been packed a little too tightly, resulting in a bit too much dry ingredients and not enough moisture. Do you scoop the dry ingredients, or spoon them into the measuring cup and then level it off with the back of a butter knife? The second method is the best way to measure. My batter was a little on the crumbly side, but did hold together when I pressed it into a ball. It’s ok if it’s a bit crumbly but if you’re having trouble with the batter holding together successfully, you might add 1-2 Tbsp additional oil or even try milk (whichever milk you use) to see if that gives the dough just enough stickiness to hold together for baking and – most importantly – eating! Ah, I was scooping the dry ingredients. I’ll try these suggestions, thanks so much! That should probably help! It seems trivial, but packing in the dry ingredient can sometimes make a big difference! Let me know how it goes! I love all your recipes, especially the desserts (super chocolatey ones 😉 and I’ve had sugar addiction problems, too, which is why I’ve been Whole 30(ish) for the past year. 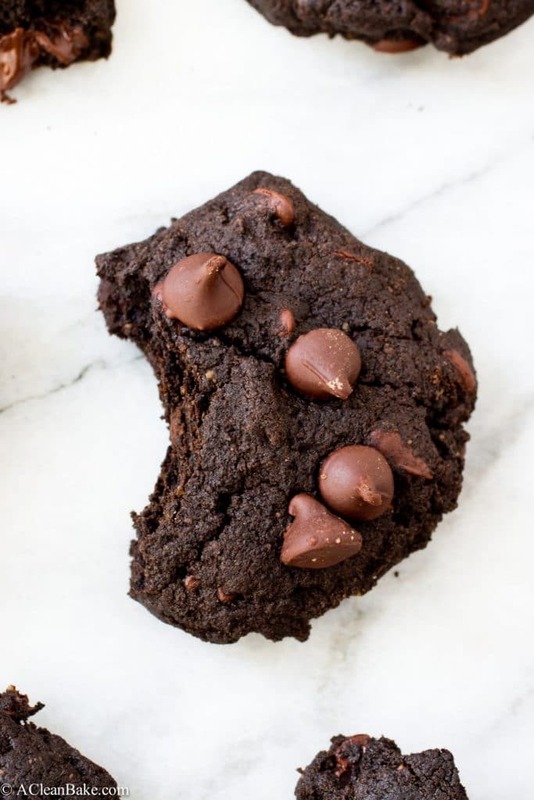 But seeing these cookies and a few of your other recipes that call for chocolate chips, which most include refined sugars, made me wonder what brand chocolate chips you use? I know the Enjoy Life brands are dairy, soy and gluten-free but they also contain refined sugars. Is there a brand you prefer that doesn’t rely of refined sugars in their chocolate chips? Or if not, what is your go-to for chocolate chips? Thanks for all your recipes and can’t wait to see what else you create!! Hi. M waiting to try these. Possible to give measurements conversion in gms or any other unit, pls? Hi, unfortunately, I don’t have those conversions handy. I’m sorry! These turned out wonderfully! Fluffy and addicting! I’m not a chocolate chocolate person, but every once in awhile I like some…so I made these. I subbed peanut butter for almond butter (I’m allergic to almonds) and used unsalted butter. I’m so happy how they turned out! Definitely making these again soon! That is wonderful to hear! Thanks for letting me know, Melissa!